of Norway has been designing clothing for extreme conditions and polar expeditions for some time, so you know their clothing will keep you warm! But you don’t need to travel to the North Pole to know that their Ladies Arctic Longs are a perfect example of this. The key feature of the Arctic Double Collection is a mesh underlayer which provides a whopping 4-6 times the insulating power of a solid knit, plus a Merino wool top layer that keeps the air inside the mesh cells and at the same time wicks moisture away from your body. The result is the warmest pair of long underwear that you’ll ever wear! The Pacific Northwest, among other places in the United States, has been hit with a cold spell with as much as 12 inches of snow in a three day period, but these longs have kept us toasty warm and comfortable. A lady’s cut, wide elastic waistband, and machine washability nicely round out the features of this base layer. 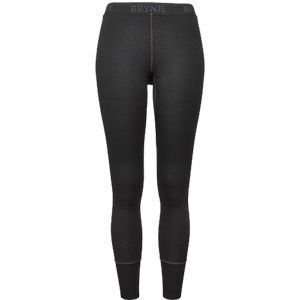 The Brynje Ladies Arctic Longs are a much needed addition to our TrailblazerGirl winter wardrobe! Editor’s Top Finds of 2014: Celebrating the Cold Weather!